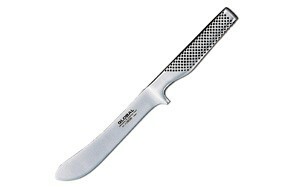 Handles - The handle, although not generally regarded to be as important as the blade, must almost certainly not be overlooked. You need to have a handle that you can grip and operate for extended periods of time without it causing your wrist to fatigue or give you any unwanted pain. The handle needs to be just right for you as you are the one who’s going to be using it. When it comes to materials as we will go on to discuss, you have the choice of wood, polymer or other synthetic materials all of which come with their own set of advantages. Blade material - When it comes to the Blade, there are also a couple of options, and they can be either curved or straight. Depending on which you go for, and it might well be a matter of personal preference, they do have their distinct advantages. 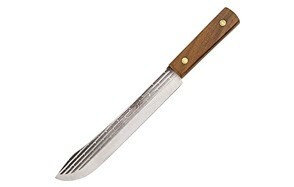 A straight style blade is more conventional and is going to be effective at cutting meat, tendons and also getting in between bones. A curved blade in comparison is better at boning and cutting but takes more practice to get the technique correct. 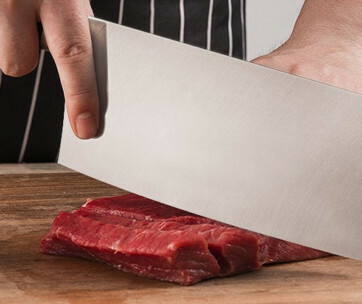 Blade material, Durability & Sharpness - You will find that your professional Butcher Knife will come in a variety of different materials too. Stamped blades are cut from a piece of stainless steel sheet so are generally more lightweight but less resistant to rust. The also won’t be as durable either. 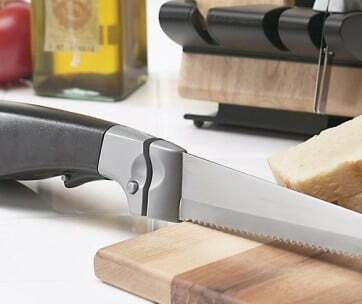 They make a more popular choice for anyone either new to knife handling or who is on a more limited budget as they are more cost effective. Forged blades, on the other hand, have been physically forged from steel and then shaped to form an actual blade. This is a far more traditional technique and centuries old. Due to the more time and expertise that goes into this process and the craftsmanship involved, forged blades tend to be more expensive, but they are sturdy, durable and long-lasting. 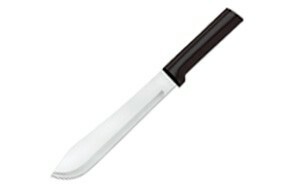 Most of the professional chefs will opt for this type of durable blade. 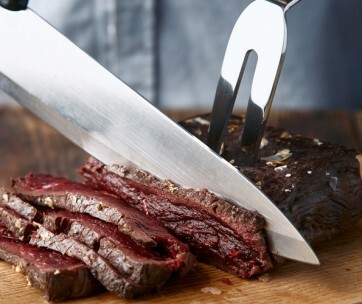 Other features to consider - You will no doubt have seen that Butcher’s Knives tend to be thinner than regular blades to allow them to slice easily through meat although some are thicker than others. The size of the blade is important but bigger isn’t always better. It’s all about the ability for you to handle and direct comfortably so choose a blade size that you can work effortlessly with.